The Doctors and the staff at Eastgate Animal Clinic would like to thank Doctor Crider for her service. We wish her good luck! All of us at Eastgate Animal Clinic are looking forward to continuing the excellent veterinary medical care your pet deserves. All of us at Eastgate Animal Clinic welcome Dr. Kristi Camp! Dr. Camp cannot wait to meet you and your pet. She enjoys canine and feline general medicine. WHERE LOVING CARE MAKES THE DIFFERENCE! Eastgate Animal Clinic offers full-service veterinary care for your beloved companion animal. Our highly trained and experienced veterinarians and staff provide both sick care and pet wellness services to pets in East Memphis, including physical exams, vaccinations, nutritional consults, allergy testing, dental care, boarding, and bathing at a great value. Our state-of-the-art medical facility hosts advanced diagnostic equipment, including an onsite laboratory, X-ray, ultrasound, and electrocardiogram capabilities. Advanced diagnostics coupled with our modern surgical suite ensures the best possible treatment outcome for your pet. 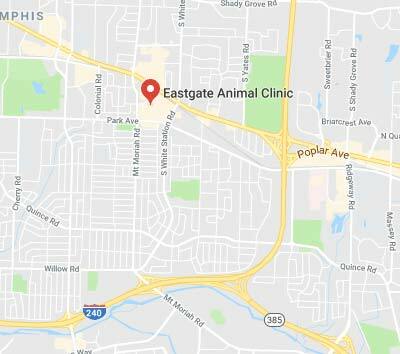 Eastgate Animal Clinic, located in Memphis, Tennessee, has served East Memphis and the Germantown area for almost 50 years. We strive to provide excellent customer service to our clients and offer unique conveniences, such as a separate entrance reserved for our cat patients and owners and drop-off appointment service. We are currently accepting new clients. Please drop in or contact us to schedule an appointment. For all New Clients--receive 15% off your first office visit! We look forward to working together to provide outstanding veterinary care for your pet. 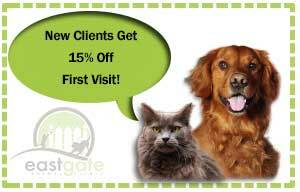 New Clients get 15% off of your intial visit to Eastgate Animal Clinic! Dr. Sweet was fantastic. I flew to Tulsa to pick up a rescue dog and drive back to Virginia. I looked on yelp and found Eastgate animal clinic. I called and they didn't have any appointments but told me to come by and they would squeeze us in. The staff was very friendly. They the best veterinary service in town. They have been caring for our dogs for over 15 years, and I wouldn't take mine to any other. They are compassionate in all treatment from birth to death. I love them like family. Dr. Smith and Dr. Balthrop have had their hands full the last 2 months with our cat Maxine and dog Ellie. Maxine battled Pancreatitis during the same time that we were trying to get her thyroid levels back to normal. They explained what was going on and reassured us when I was concerned that she wasn't getting better as fast as I thought she should. Maxine can be not so pleasant, but they don't seem to mind too much. Amazing staff!!!! Thank you!!!! For referring us to the Memphis Area Golden Retriever Rescue! They found a wonderful place for my sister and brother's dog!! Within 24 hours they contacted us. Thank you Dr. William Sweet for providing more options and information that we had no knowledge of! God bless your hearts!